This is my first time in Looking at the Sky on Friday meme. WOW, your picture is beautiful! Did you Photoshop it a lot? Wow! what a wonderful capture Linda. WOW! I LOVE how you captured this little guy with the sun outlining his body! Very exceptional photograph! That shot looks worthy of showing up on a cover of Johnathan Livingston Seagul. i bet that sweet little kitty would love that bird! Wow...that photo is worthy of a Hallmark Moment! Love the play of light on the wings. Linda that is just beautiful. It reminds me of Jonathan Livingston Seagull - my favourite book of all time! That shot is amazing. It looks so warm too and most of us are ready for that. The blue skies and sun's rays are stunning, a simple look at nature. However, the sun glare shows up on the trailing edge of the gull's wings, leaving a bronze glow on the bird. Nice view from a D60! That is an extraordinary shot, Linda! Composition, lighting, color, contrast--everything perfect! That is stunning. Well done, Linda. oh, wow - no photoshop, that's both: good luck and correct settings! Well done! It's beautiful, Linda. 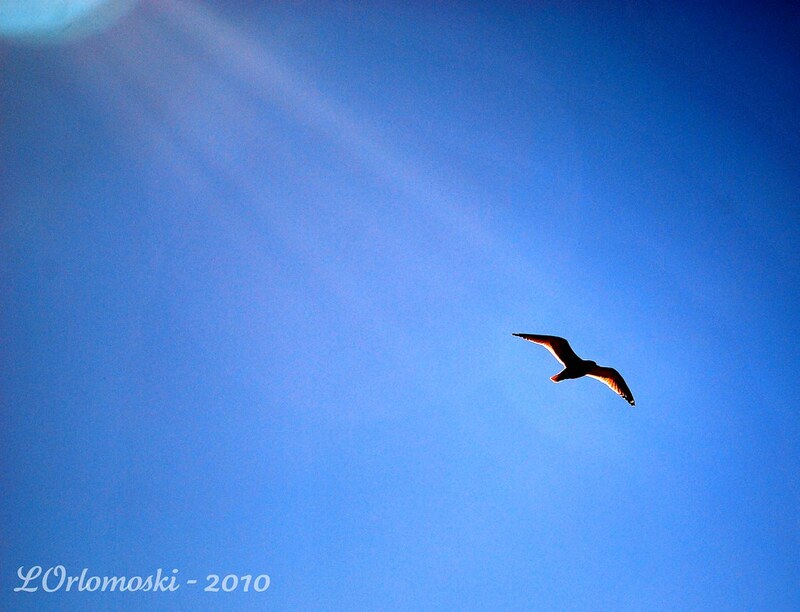 I love how the sun's rays are beaming down and lighting up that seagull. Brilliant!!! Those beautiful blue skies are breath taking.